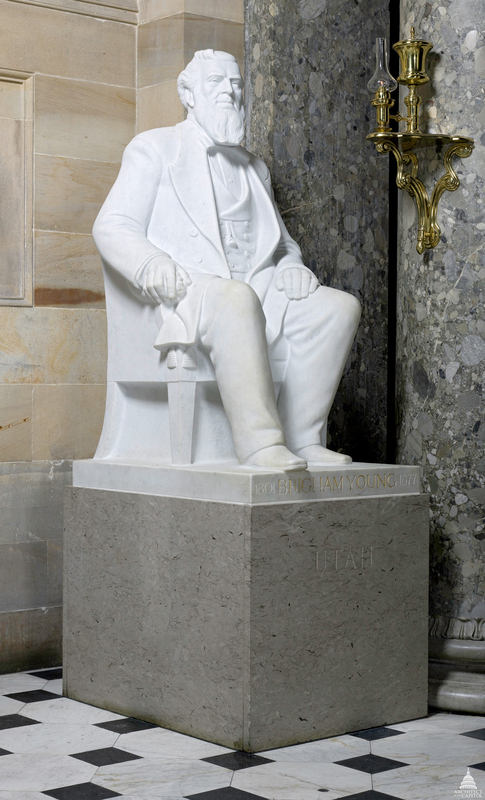 This statue of Brigham Young was given to the National Statuary Hall Collection by Utah in 1950. Young was the first governor of the Utah Territory and a religious leader. Brigham Young was born in Whittingham, Vermont, on June 1, 1801. His family later moved to upstate New York, where he became, successively, a journeyman painter, glazier, and farmer. He sought a religion applicable to daily life and after two years of study he became a member of the Church of Jesus Christ of Latter-day Saints. He rapidly earned positions of leadership within the church, and in the 1840s Young was among those who established the city of Nauvoo on the Mississippi River. It became the headquarters of the church and was larger than the city of Chicago. In 1844, upon the death of their leader, Joseph Smith, Brigham Young became president of the church. Within two years persecution drove the "Saints" to territory outside the boundaries of the United States. In 1847 he led a party of 148 to the Salt Lake Valley. Young, sometimes called a "modern Moses," successfully organized the emigration of 70,000 pioneers. As the first governor of the Utah Territory, he encouraged farming, industry, thrift, the establishment of retail stores, cooperative irrigation, schools, universities, and theatres. Because the territory was so far from supplies, Young introduced other industries, including cotton and silk, to build self-sufficiency. Known as one of the world's great colonizers, Brigham Young established communities between Mexico and Canada before his death on August 29, 1877, in Salt Lake City, Utah.